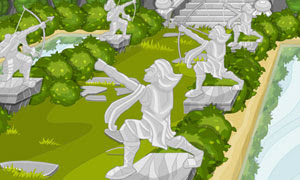 The Spell Breaker Quest - A Prince Ivan Adventure is another point & click, escape game by abroy. It's upon you to embark on a magical journey with Prince Ivan of Banarkash in his quest to save his sisters. It doesn't end there...You also have to revive their cursed husbands, marry the Sun Princess and defeat a Giant Dragon Wizard in a battle. all this in one adventure! Good luck and have fun.